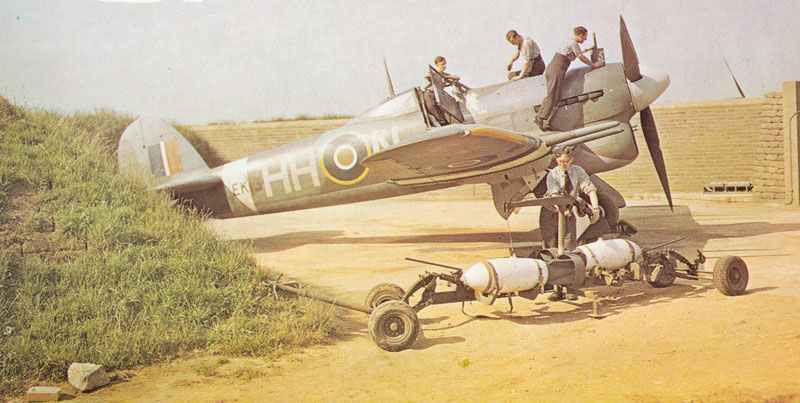 175 Sqn service crew and an armourer with two 500-pound bombs tend one of the earlier Mk 1B Typhoons with car-type doors and a rigid radio mast. One of the main run of Mk 1B Typhoons with the neat and unobstructed sliding teardrop hoop from the 54 Squadron. The Hawker Typhoon ‘s early life was almost total disaster. Though the concept of so big and powerful a combat aircraft was bold and significant, expressed in Specification F.18/37, the Griffon and Centaurus engines were ignored and reliance was placed on the complex and untried Vulture and Sabre. The former powered the R-type fighter, later named Tornado, which ground to a halt with abandonment of the Vulture in early 1941. The N-type (Napier), named Hawker Typhoon, was held back six months by the desperate need for Hawker Hurricanes. Eventually, after most painful development, production began at Gloster Aircraft in 1941 and Nos 56 and 609 Sqns at Duxford began to re-equip with the big bluff-looking machine in September of that year. But the Sabre was unreliable, rate of climb and performance at height were disappointing and the rear fuselage persisted in coming apart. There was much talk of scrapping the programme, but, fortunately for the Allies, the snags were gradually overcome. In November 1942 the Hawker Typhoon suddenly sprang to favour by demonstrating it could catch and destroy the fastest fighter-bombers, like the Focke Wulf Fw 190 , in the Luftwaffe which were making low-level hit-and-run raids. In 1943 ‘Tiffy’ squadrons shot-up and blasted everything that moved in northern France and the Low Countries, and in the summer of 1944 the hundreds of Typhoons – by now thoroughly proven and capable of round-the-clock operation from rough forward strips – formed the backbone of 2nd Tactical Air Force attack strength, sending millions of cannon shells, rockets and heavy bombs into German ground forces and in a single day knocking out 175 tanks in the Falaise gap. Gloster built 3,315 of the 3,330 Typhoons, the final 3,000-odd having a clear bubble hood instead of a heavy-framed cockpit with a car-type door on each side. Initial climb 3000 ft / min. Tagged 1943, fighter-bomber, hawker, raf, uk.